Noble begins with an interesting premise, years before she brings her hero, “Lucky Ned” Granville, Earl of Ashby, and heroine, governess Phoebe Baker, together. Her premise is “fortunes falling, fortunes rising.” When Ned was twelve, living modestly with his mother in Hollyhock, Leicestershire, his uncle, the then earl, sent him to school, grooming him to be the future earl. Ned never saw his mother again. When we meet him, Ned is a careless, carefree, amoral aristocrat; he’s not a charming rake, hiding his kindness and consideration. It’s not his dissipation that is important, but his attitude towards others and self-importance. When Phoebe was seventeen, she, because of her father’s bad investments, lost her place in the world: from soon-to-be débutante to orphaned governess (and unlike Jane Eyre, whom Miss B. couldn’t help but think of, no fortune lurks in the shadows to make her palatable to an aristocratic husband). In the midst of her loss of fortune is a fraudster, Mr. Sharp, who also milked the then young earl, Ned. Phoebe’s rage, at the time, led her to writing two hate-filled letters to the young man who had the power and privilege to put an end to Mr. Sharp and did not, though he too had been defrauded by him. When we meet her five years later, Phoebe has wrested equanimity from her situation; she makes the best of her governess role, loving her charges, the delightful Rose and Henry, daughter and son to Sir Nathan and Lady Widcoate, and reveling in her teaching role. Her misfortune has given her, if not passion, then contentment and occasionally delight. Phoebe remains a model of hard work and positive attitude: a lesson that Nat needs to learn if his life is to have purpose. The players, Ned and Phoebe, as well as compelling secondary characters, John Turner, Ned’s secretary, and an impoverished, widowed countess, Leticia Churzy, are brought together by the eponymous “game,” which turns out to be a wager between Ned and John. Desperate to save his family’s mill and dissatisfied with his financial need to stay in Ned’s employee, John Turner bets his precious mill to Ned’s 5 000 pounds that Ned, if he switches social places with him (while Turner takes his “turn” as Ned, the Earl of Ashby) will not capture the heart of a gently-born lady. His charm, says Turner, lies in purse and privilege rather than himself. Ned is bored and arrogant and takes on John’s dare. The scene is set when they exchange roles and travel to Hollyhock, Leicestershire, to sell Ned’s mother’s house, a house he hasn’t seen since he was twelve. They are hosted by Sir Nathan and Lady Widcoate and they meet the governess, Phoebe Baker, in a scene of horse and rider reminiscent of Jane Eyre and Rochester. Noble, however, foils our romance expectations: the governess and Ned, whom Miss B. immediately identified as our romance couple, have little to do with each other for the 40% of the novel. Instead, Noble focuses on what Ned and John learn about place and privilege: Ned recognizes that the attention he receives is due to his social position and, John, that privilege and wealth come with their demands and uncertainties. Miss Bates loved following this aspect of the novel and saw in it the theme of standing in someone’s else shoes as a lesson in empathy. To the romance reader looking only for an “escapist” read, this moral component slows the romance narrative. But, Miss B. loved it. This doesn’t mean that the romance per se is devoid of ideas. Au contraire, Noble penned a romance that challenges the conventional narrative pattern of romance wherein the lowly governess is elevated to rank and fortune, very much like Charlotte Brontë did. Instead, it is Ned, the seeming secretary but actually an earl, who learns about eudaemonia: how to be happy, irrespective of the trappings of rank and wealth. He is elevated to happiness via his association with Phoebe. Phoebe teaches him that happiness must be chosen and worked at, not assumed on the basis of privilege and class. Ned admires Phoebe even before he realizes he loves her because she has philosophized her way to contentment, to enjoying a life that is, at least as it would be judged by society, hard if not harsh, unassuming at best, precarious at worst. In taking on Turner’s status, Ned is forced into solitude and servitude and the two states serve him well: they humble and teach him, but they also, to his surprise, make him happy. He is happy because he is useful to Phoebe and the children; he has purpose because his days are filled. He is falling in love because he has someone to share his heart, mind, and soul. This comes from Phoebe as the moral arbiter of the narrative because she teaches him about the value of relying on yourself for your happiness. When, as John Turner, he first enters Phoebe’s room, he notes the beautiful paintings (just as Rochester does Jane’s). Phoebe has carved a life for herself that helps others, as well as appreciates art and beauty. When Ned begins to teach the children to ride, when he looks forward to each day as he gets to know Phoebe better, he is suddenly truly happy. And as he experiences happiness, he is able to recognize how difficult Turner’s and Phoebe’s lives have been. “What a tangled web we weave/when we first practise to deceive,” (thank you, Sir Walter Scott): Ned contends with his deceit when the game ends and end it must. Suddenly, being a lowly secretary is the only thing he wants, because this allows him to have Phoebe in his life. Confessing his true identity is how he will lose her. Miss Bates loved the ethic of Ned’s dilemma and its expression in “he who finds his life will lose it,” as Ned lost his in status and entitlement, and “he who loses his life will find it” in a governess’s lessons of joy and friendship. Moreover, if the reader stays with this lovely romance novel, there are wonderful, magical scenes of romance, love, and desire under the stars. A novel of ideas and delicious romance, this is one of the best romance novels Miss Bates has read this year. In it, Miss Bates found that “there is no charm equal to tenderness of heart,” Emma. 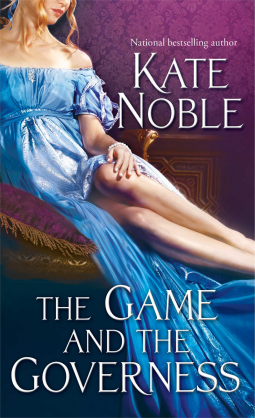 Kate Noble’s The Game and the Governess is published by Gallery Pocket Books, a division of Simon and Schuster, and has been available since July 22nd, at the usual vendors and usual formats. Miss Bates is grateful to Pocket Books (Simon and Schuster) for an e-ARC, via Netgalley, in order for her to consider the novel for review. What romance novels of ideas have you read and loved? Terrific review, Miss B. This book seems to have provoked divided reactions, but I’m in your camp, I thought it was excellent. That’s really cool: Miss B. was reading as you were listening. She thought this was quite original, interesting. She read some reviews where the reviewer didn’t much like Ned and it’s true that he was initially difficult to like, not like Lerner’s In For a Penny’s Nev, who reveals his inherent decency almost immediately by deciding to marry for “convenience” over asking his sister to do so. Here, Ned is pretty awful, immature, and arrogant. So, his transformation is all that more interesting and it was nice to see such a flawed hero be redeemed: he wasn’t rapey or weird, or possessive, or stalkerish: he was just not a good guy, not for a long time. On a happy note, Miss Bates might have Revealed somewhere in the print TBR!